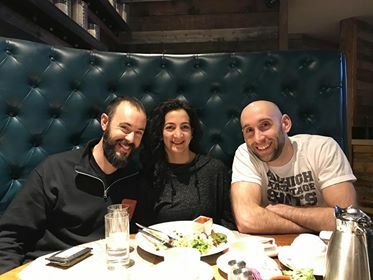 Owen, Lucy and I following the Resistance Exercise Conference at the Graduate Hotel in Minneapolis, Minnesota, US. Owen Dockham started Live Oak Strength and Nutrition (and co-founded Everstrong San Francisco) to offer a rational, safe, and effective approach to exercise not found anywhere else in the eastern bay area. Having supervised over 7000 one-on-one personal training sessions, with individuals ranging from ages 13-87, Owen has found that everyone has something positive to gain from their unique, evidence based approach to exercise. Through his career in the health and wellness industry, Owen has learned how to help guide people to accomplish meaningful results; effectively, without hurting them and without wasting their time doing dangerous or inefficient movements. Owen believes exercise should enhance life and not consume it, and should never under any circumstances cause injury. That’s why Owen and his team adhere to the principles of high-intensity training, supervising brief and intense workouts, on a one-on-one basis, in a beautiful facility free of distractions. Like many health practitioners, Owen’s passion for what he does stems from his own personal obstacles that were overcome by implementing the modality he’s now deeply invested in teaching. Many wasted hours at the gym following genetically gifted fitness marketer’s advice, left Owen constantly frustrated and feeling like a failure. He learned, studied and implemented the principles of high-intensity training into his workouts and started to gain muscle, energy, and feel more confident and experience less regular aches and pains. He knew he had to share this amazing work with as many people as possible, and nothing was going to stop him. Outside of Live Oak, Owen enjoys playing classical and jazz piano, the outdoors, the company of his beautiful fiancée Lucy, two pit bulls, Luna and Sophie and their cat Darwin. It is his dream that everyone has the strength, courage and patience to pursue their dreams like he has. Owen is honoured to help anyone willing to go for it. In this episode, Owen shared some excellent tactics for growing your strength training business. Owen has had a lot of success acquiring many new customers through networking (BNI). Joining a networking group is a very effective way to improve your networking skills, perfect your business pitch (value statement), improve public speaking skills, and build life-changing relationships. Owen and I go deep on the benefits of networking and how to leverage it for maximum benefit in your business. QUESTION(S) OF THE DAY: What is the most effective tactic you’ve used to grow your strength training business? Let me know in the comments below. Hi guys! I liked this one very much. Thumbs up Owen and thanks for sharing your story ! Great interview as always! I am also a musician and I find there to be great parallel between the mindset and approach required to perform a skill at a high level (playing an instrument), the practice skills, and the approach required to perform a High Intensity Strength workout well. Progression follows a similar curve – fast initial progress, followed by leveling off, then plateaus if practice isn’t mindful and lacks some sort of feedback mechanism. Here’s another plug for occasionally getting someone to record your workouts so you can go back and watch them! I could probably write or speak somewhat extensively on this topic (many thoughts in my training log…). It doesn’t have to be music – could be martial arts, sport, or anything where you’ve spent time developing excellence in an area. I’ve got other projects that are calling for my attention, though. The Resistance Exercise Conference sounds like it would great. I’m working on your productivity tips to get my income up so that I have some extra to look at things like the REC. Interesting. If you ever write or speak about that let me know. Would love to learn more. I’ve got a track to run on now for the work stuff, so I’m sure it will come together.